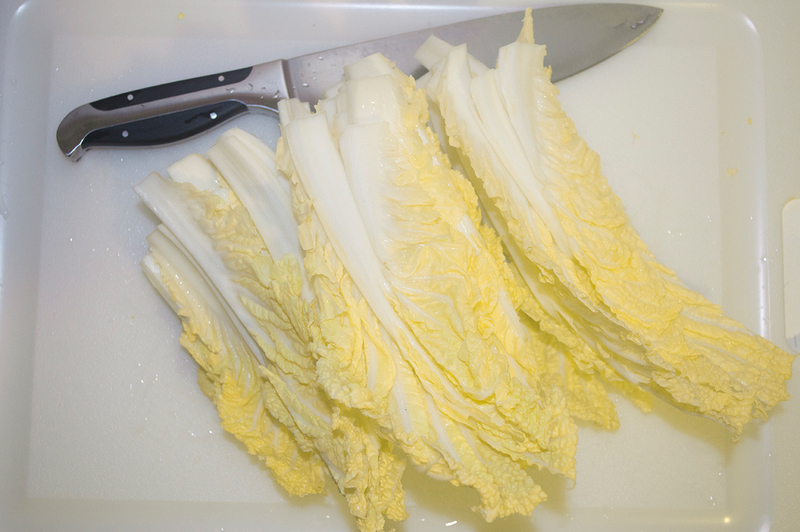 Fresh Cabbage Kimchi (배추 겉절이 – baechu geotjeori) is often made with smaller napa cabbages for their tender leaves and natural sweetness. It is prepared slightly differently than regular Cabbage Kimchi, and eaten right away instead of waiting for the dish to ferment. 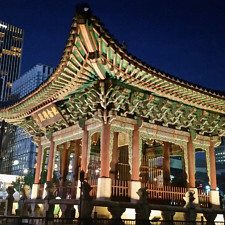 My hubby loves to eat this side dish (반찬 – banchan) because of the roasted nuttiness of the sesame oil juxtaposed with the freshness of the cabbage; it creates wonderful layers of texture and flavor. 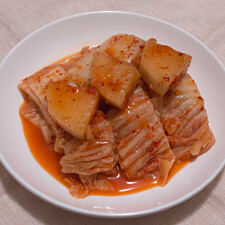 It’s great to make this kimchi during the Summer months without the hassle of turning your burners on; you can equally enjoy geotjeori in the cooler months with a protein dish like Grilled Sliced Brisket (차돌박이 – chadolbaegi), or a steaming bowl of rice with a variety of side dishes. Strip the leaves off of the cabbage. Rinse and slice lengthwise in ½-inch thickness. In a medium bowl add the salt and cut leaves, and toss until the salt is well incorporated. Set aside for 1½ hours, or until the salt has brined the cabbage. While the cabbage is brining, wash the scallions and cut them into lengths of 1½ inches. In a small bowl add the cut scallions and the rest of the ingredients. Mix together. Set aside. Rinse the cabbage when it is done brining. Drain well. Add the seasoning mixture into the medium bowl. Mix thoroughly. 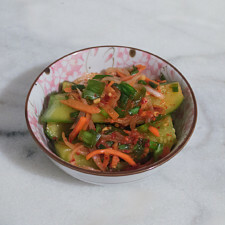 Taste-test and see if the kimchi needs more fish sauce or salt. It should be briny, nutty, and slightly sweet. Place all of the fresh cabbage kimchi into a container. Chill for a couple hours, or eat right away! Flip the cabbage halfway through the brining stage. This will help thoroughly brine the cut cabbage. You are welcome to rinse and taste a piece at this stage to see if the cabbage is salted well. The rinsed cabbage leaves should taste salty; not just on the exterior, but the inner parts of the cell walls should taste briny. 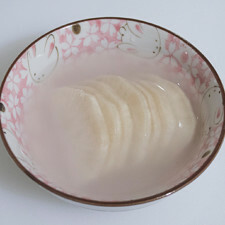 The sugar only adds to the natural sweetness of the cabbage heart. If you feel the need to not add any sugar, or if you need to add more sugar, do so to your liking. You can make this a day ahead. 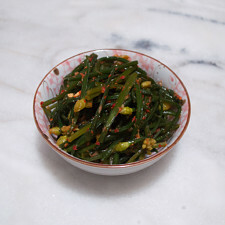 I often prefer eating geotjeori the following day because this allows all of the seasoning to meld. Chilling the kimchi adds to the freshness, like a salad. Store in the fridge for up to a week. If you’re expecting leftovers past the one week, consider making Kimchi Stew (김치 찌개 - kimchi jjigae), Kimchi Soup (김치국 - kimchi guk), or Kimchi Fried Rice (김치 볶음밥 - kimchi bokkeumbap). 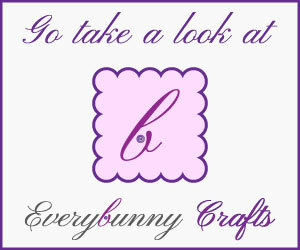 Don’t throw it away! 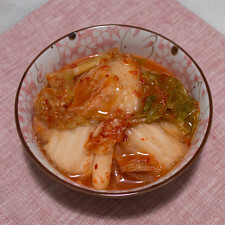 Made our Recipe for Baechu Geotjeori (배추 겉절이) - Fresh Cabbage Kimchi? See those yellow leaves? It’s the yummy cabbage heart! I’ve sliced the leaves here into long strips about ½-inch thick. Sometimes I don’t want to cook the rice paste for regular kimchi, and I want to be able to enjoy the fresh vegetable crunch. This often results to me making this fresh cabbage kimchi, also referred to as “instant kimchi” in our home, which always makes me smile and my Korean tummy happy. 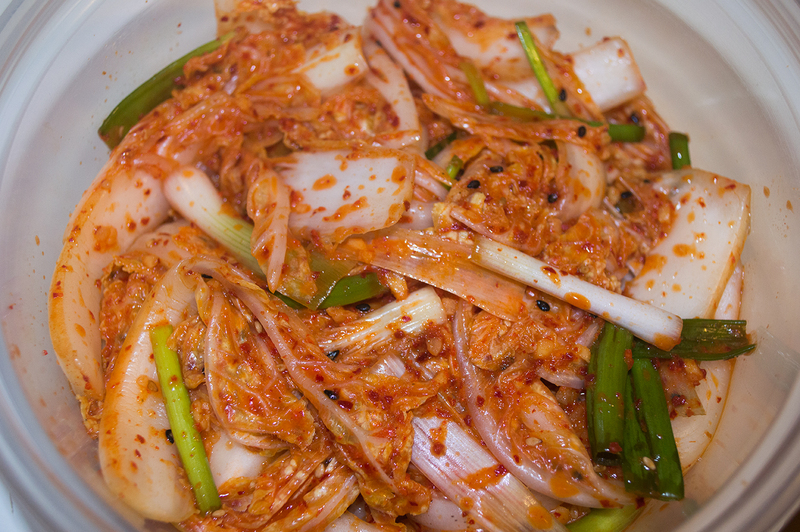 No thoughts on "Baechu Geotjeori (배추 겉절이) – Fresh Cabbage Kimchi Recipe."